How far one should go to help his sibling…Can we draw a line in blood relationships? What happens…when we stop counting our blessings and long for fictitious pleasures, when lust takes over gentle senile notions of love and when you lie to yourself and justify it? Is there any date sheet for emotions? This novel tries answering these questions through a beautiful story. Besides it also touches the emotions that cross our heart when we embark on the journey of betrayal. It is also an attempt to locate that man in the mirror that we generally choose to ignore. 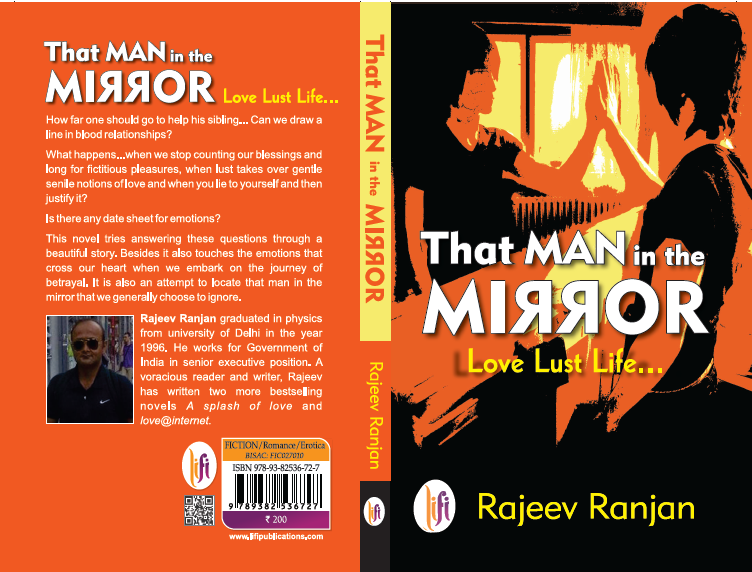 That Man in the Mirror is about everything it claims to be – Love…Lust…Life! It is real because it talks about human emotions that bring about a feeling of euphoria and then deep uncontrollable pain and regret. The story woven by the author is real and anyone can associate with it. The female characters in the novel are projected as strong individuals who are entirely different from each other. While reading the novel you cannot help but draw a comparison between each of them and people you know. The protagonist Raghav is a man with dreams who knows what he wants and yet loses his way somewhere in his quest of finding happiness and realizing his dreams. He makes decisions, he doubts himself, he questions his motives and then he regrets his decisions and starts making amends. I liked the way the author has mentioned topics like superstitions, quacks, adolescence, pride, lust, love and regret. He has woven each of these feelings neatly into the novel which helps the flow of the story. I especially like one quote - “Silent people are the most difficult to understand.” I loved the fact that the book ended on a positive note…After all I love happy endings! The beginning was good, but then somewhere in the middle the story became very predictable; this changed after a few chapters! In my opinion the author could have added more details about a few characters - his brother and father. There is a brief mention about them, but a little more details about how they felt, what they were going through etc. would have made the book more interesting. A more visually appealing cover would have aroused more interest in the book, but as they say don’t judge a book by its cover; so I would like to end by saying…That Man in the Mirror is an interesting novel which will certainly touch a chord in your heart! Mail me at myriadhues14@gmail.com if you want to be featured on my blog!